As a Teacher, I need to keep myself as healthy as possible. 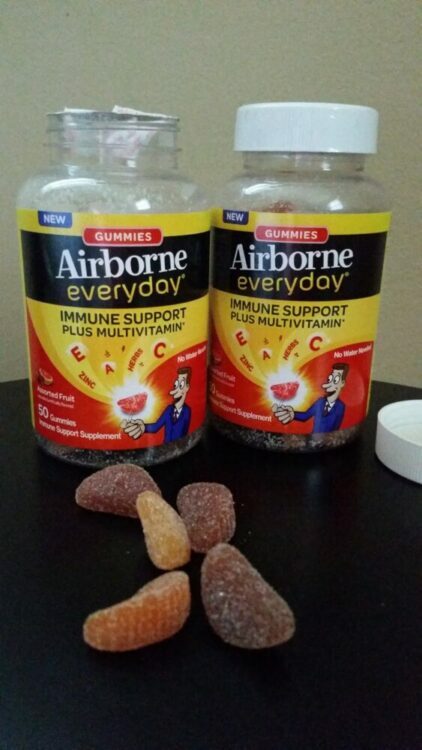 I recently received a bottle of Airborne ® Everyday ™ multivitamin plus gummies from Airborne to try out and share with you. I’ve never used Airborne daily. My experience was always with the dissolving tablets, so this was a change. I was excited to try these because I’m a big fan of anything gummy. And, if I could convince myself that these were the candy gummies I love, maybe I wouldn’t eat so many gummies throughout my day. I sort of buy 5lb. bags of gummies from Costco to keep in my desk, and so I eat them a lot. I don’t think I can convince myself not to eat the real kind, but these were pretty nice. They have a great sweet, citrusy flavor when you first eat them. The flavor goes, and they’re a bit more chewy than a normal gummy, but they’re good. I have two kinds of multivitamins in my cabinet that I buy in hopes I’ll start taking them in the morning. Truthfully, though, in the morning the thought of taking a pill is stomach churning. I like that these don’t have to be swallowed, and can be taken at any time without a drink. I’ve tried to keep myself healthy in other ways as well. I’ve started to really try to force myself to drink more water. I drink a lot throughout the day, but generally don’t drink too much water. It’s something I’m mentally trying to shift. Part of the problem is that during the day I don’t think about taking drinks, and my water just sits. Of course, there’s also the whole can’t-go-to-the-bathroom issue. So, I’m trying to drink more water in the morning right after I wake up, and then more in the evening. I was afraid I’d need to get up in the middle of the night, but it’s not really been a problem. coop through a local farm and it’s resulted in me having fresh oranges and apples that I can eat daily. For now, my goal is to eat at least either an apple or an orange each day. The last area I need to tackle is the gym. I’m always tired, or frustrated, at the end of the day it seems. Or, I just talk myself out of going to the gym. I recently expressed this frustration on my Instagram page where I shared the ice cream I purchased that night. I seem to eat my feelings. Well, a friend and I got to talking and we’re going to try going to the same gym, and go in the morning before work. I need the accountability to keep me going. So I hope to start that in the next week or so and that should put me on a great path for the rest of the school year! What do you do to stay healthy? Do you want to try the Airborne multivitamin for yourself? I get to give away a bottle of Airborne Everyday Gummies to 3 lucky readers. Leave a comment on this blog post and tell me what you think of Airborne Everyday Gummies and how they can help you better support your immune system. Winners will be chosen on May 1st. exchange for this post. All opinions expressed are my own. The Airborne Gummies look delicious! I use the chewable tablets right now and I think they helped me to stay healthy during one of our worst winters yet! I think the gummies would be fun to try in place of the chewable tablets! I have never had the Airborn Gummies, but I have used their other products, especially during the winter months where germs seem to spread in my home and classroom. I heard this company/product was started by a teacher. I have been really bad about vitamins as of late, which is not good because I am on the busy side of my year. I have never tried Airborne products! I would be interested in trying the gummy version. It seems that the colds are coming back for another round this spring. I have never tried the gummies but have used the effervescent tablets. What a lifesaver when traveling! I've used other Airborne produces, every time I think I might be getting a cold, I start taking Airborne and my symptoms go away! I also love gummies, if the Multivitamins work just as well, then I will be definitely using them! I've never tried Airborne gummies, but I could really use them! I work for a school department so I'm around a ton of germs haha. I already use Airborne when I feel a cold coming on, but I'd love some daily immune support. Plus, gummies are yummy! I always drink a lot of water and try to eat a good amount of veggies every day. To stay healthy I try to work out and do cardio several times a week. I also do not eat fast food. I think I could handle Airborne Gummies. 🙂 I can think of a couple times this year that they would have come in handy.